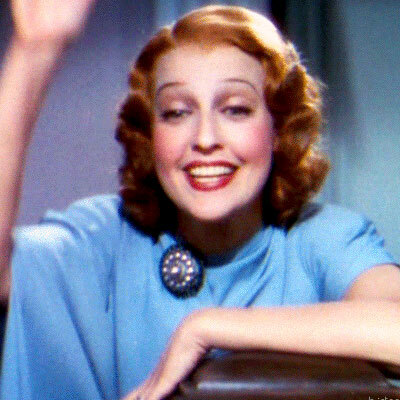 Singer/actor Jeanette MacDonald was one of the very first stars of motion-picture musicals. Born in Philadelphia, PA, on June 18, 1903, MacDonald inherited her love of singing and dancing from her two older sisters (her eldest sister, Elsie, taught MacDonald songs at a very early age). At the age of six, MacDonald made her first public singing performance, singing the role of Old Mother Hubbard at Philadelphia's Academy of Music. Before she was a teenager, MacDonald had toured both Pennsylvania and New Jersey as one of Al White's "Six Sunny Songbirds," as well as further studying singing, dancing, piano, and regularly teaching Sunday school. At the age of 16, MacDonald saw one of her sisters perform on Broadway in New York, and immediately wanted to follow in her footsteps. A tryout was quickly arranged for Jeanette, who landed a dancing spot as part of the chorus in the Demi-Tasse Revue at the Capitol Theatre on Broadway. Until the age of 25, the youngest of the MacDonald sisters paid her dues dancing on Broadway (even though singing remained her true love), appearing in such musicals as The Night Boat, Irene, Tangerine, and Fantastic Fricassee. Her first substantial singing part finally arrived in a production called The Magic Ring, which led to further roles (Tip Toes, Bubbling Over, Yes, Yes Yvette, and The Studio Girl), and by 1927, MacDonald had established herself as a bona fide Broadway star - landing leads in both Sunny Days and Angela, and starring alongside a young Cary Grant in 1929's Boom Boom. It was her spot in Boom Boom that gained the attention of Hollywood movie director Ernst Lubitsch, who offered MacDonald the lead in the latest film musical he was working on, The Love Parade. Soon after, MacDonald moved to Hollywood, where she instantly became one of Hollywood's earliest singing stars. Although MGM initially tried to paint MacDonald's characters as innocent and fresh-faced, she eventually gravitated toward more suggestive roles (including such then-shocking scenes as MacDonald filmed in a bathtub, or in lingerie). By the dawn of the '30s, motion-picture musicals were quickly becoming yesterday's news, and MacDonald decided to change with the times, taking her first non-singing acting roles. But MacDonald couldn't put her first love behind her, as she launched numerous concert tours across the U.S. and Europe. It was her movie roles in the late '30s that gained MacDonald her greatest success however, including such titles as The Merry Widow, Naughty Marietta, Rose Marie, Sweethearts, and Maytime, as she starred alongside such notable actors as Clark Gable, Ramon Novarro, Allan Jones, and Gene Raymond, the latter of which MacDonald married in 1937. She co-starred with Maurice Chevalier in four films and with her most famous screen partner Nelson Eddy in eight films. During the early '40s, MacDonald performed in her first opera, as Juliet in a production of Romeo and Juliet in Montreal, Canada. This led to further operatic roles, such as the role of Marguerite in Gounod's Faust at the Chicago Civic Opera, as she performed operas straight up until the early '50s. MacDonald was thought to be retired from the movie/music biz, but she would reappear here and there, including recitals at Carnegie Hall, television work (as the "voice of Firestone"), a nightclub act in Las Vegas, and a stage tour of The Guardsman alongside Raymond. In 1957, MacDonald sang at the inauguration of U.S. President Dwight D. Eisenhower, before she began to suffer from ill health � largely due to a heart problem, succumbing to the condition in a Houston, TX, hospital on January 14, 1965 (shortly after having open heart surgery). Numerous collections of MacDonald's songs have surfaced since her passing, including such titles as 1991's Sings San Francisco & Other Favorites, 1993's Ah Sweet Mystery of Life: An Anthology (1931-1938), and 1994's When I'm Calling You.